Everyone knows Sonic the Hedgehog, the well-known character from the Sega videogame series of the same name as well as Sega’s UFO Catcher popular in Japan. 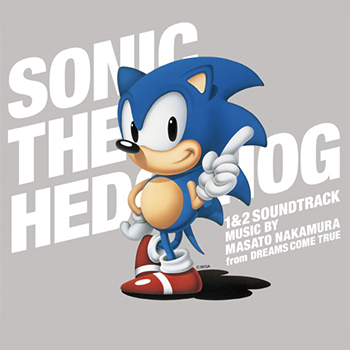 But did you know that the game music from Sonic the Hedgehog 1 & 2 was composed by Masato Nakamura? This highly anticipated soundtrack is now available in Japan & the US! More than 70 million copies of Sonic the Hedgehog have been sold around the world!! When the game first went on sale, Sonic was voted Most Popular Game Character by American teens. This year marks the Twentieth Anniversary of Sonic the Hegdehog! The “Sonic the Hedgehog 1&2” Soundtracks will be released for the first time ever to celebrate the 20th anniversary celebration of this internationally known game. In addition to the nostalgic sounds straight from the Megadrive game screens, the CD includes several original songs written by Masato Nakamura from the time he was composing music for the game. This album is not just for fans of Sonic the Hedgehog, but trackmakers will love it, too! Bonus tracks include the games’ ending theme, recorded by DREAMS COME TRUE; “SWEET SWEET SWEET”, “SWEET DREAM”, “SWEET SWEET SWEET -06 AKON MIX” and “SWEET DREAM -06 AKON MIX-”. Yuji Naka: Founder of Prope Ltd. Naka began working for Sega in 1984. Involved with Sonic the Hedgehog from it’s inception, he led the team of programmers as Executive Producer of the Sonic Series. A rare, early illustration of Sonic the Hedgehog, drawn at the very beginning of the games’ creation and personally collected by Masato Nakamura, will be included with the CD.